#1895 Bare Behind Cowgirl Postcard ! 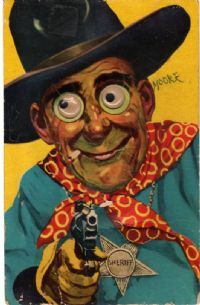 This is a nice old RPPC Western image! This sharp detailed RP view pictures a rodeo rider atop a bucking bronco! Front of card reads "F. Stevenson Leaving Sure Shot , R.R. Doubleday". A very nice Real Photo postcard view! Back of card is undivided and postally unused. Back has an "E K K P Place Stamp Here" stamp box. Condition-Good, with some creasing at lower left as shown. This is a nice Western related card! 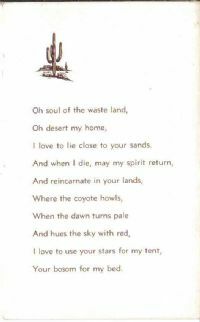 It's an old poem about the West with a cactus motif. Back is divide with no stamp box. Publisher is J. O. Jackson, Phoenix Arizona. Condition is near mint! #262 1905 Cowboys Branding Cattle! Here is a super cowboy related postcard image!It pictures several cowboys rounding up and branding cattle. The front reads "6764 Branding , Copyright 1905 By Detroit Publishing Co.". Back is undivided and postally unused. Condition is very good as shown with light edge wear and small flake at left as shown. A great card!